Orecchiette Pasta with Romanesco Broccoli, Burrata and Anchovies. 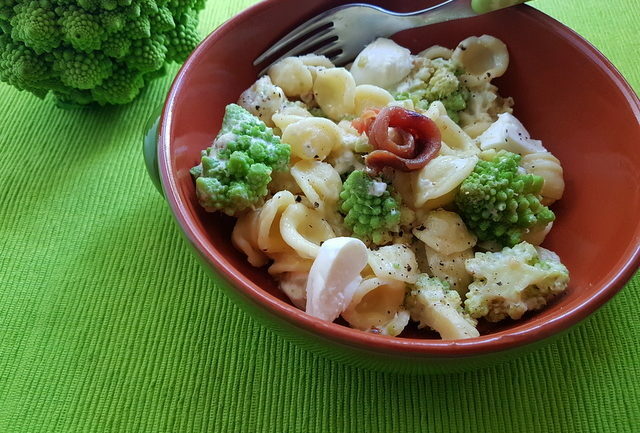 This orecchiette pasta with Romanesco broccoli is based on a traditional recipe from Puglia. It can be made with other types of broccoli too and is a wonderfully delicious and nutritious winter pasta dish. I’m totally in love with Romanesco broccoli. It’s not only the most amazing looking vegetable but has such a wonder delicate and slightly nutty taste. Also known as Roman cauliflower, this natural work of art is a member of the brassica family of veggies. This family includes cauliflower, broccoli, cabbage, kale and Brussel sprouts to name a few. Romanesco broccoli has actually been grown in Italy since the 16th century. So, it’s not, as some believe, a modern hybrid between broccoli and cauliflower. Romanesco broccoli in the Italian kitchen. 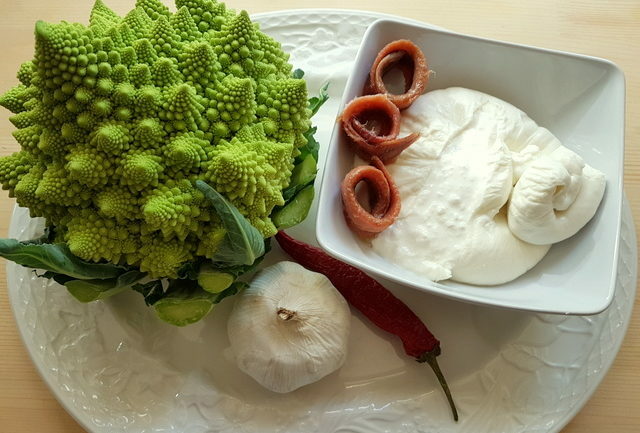 Here in Italy, Romanesco broccoli is often eaten as a side dish. Italians like to boil it and season it with oil and vinegar. They also serve it au gratin with béchamel sauce or fried in batter. However, it’s a very popular ingredient in soups too. The most traditional soup with this broccoli comes from Rome and is sometimes made with skate. You can find this recipe here. Skate is a fish that’s not so easy to find where I live, so my recipe doesn’t include it. But, it’s delicious even without the skate! Needless to say, pasta with Romanesco broccoli is popular too. And, there are many pasta recipes which include this wonderful vegetable. This orecchiette with Romanesco broccoli, burrata and anchovies is based on a recipe from Puglia. There orecchiette is the most typical type of pasta. And, orecchiette with broccoli is a very well-loved traditional dish. It’s also very popular in other Southern regions too, especially Campania. In Puglia and Campania, they are more likely to use a local type of broccoli called broccoli Baresi or broccoli rabe. In fact, orecchiette with broccoli rabe is very similar to this recipe. The main difference being that it’s common to boil the pasta and the veg together. Actually, you can use any type of broccoli for this dish. Broccoli is very much a staple winter vegetable throughout the Italian peninsula. Interestingly, it was the Italians who gave the world broccoli. They have cultivated it in Italy for more than 2,000 years. Yet, it was only first introduced to Great Britain in 1700s and didn’t become popular in US until 1920s!! 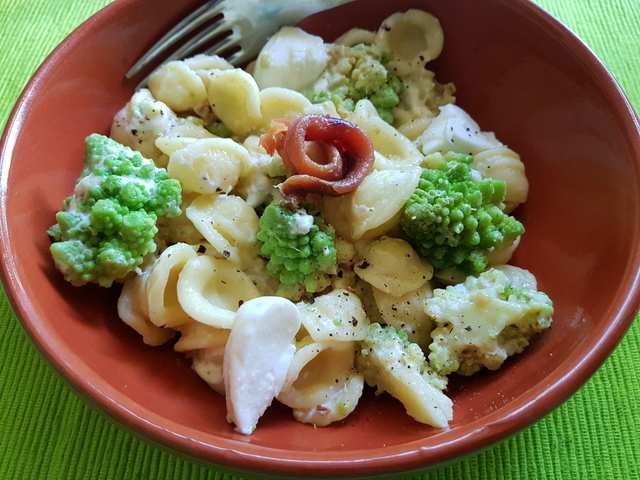 Apart from using a different type of broccoli for this orecchiette with Romanesco broccoli, this recipe is the almost the same as the traditional one from Puglia. The other difference is the addition of burrata instead of grated pecorino. Burrata is probably the most famous cheese from Puglia. If you like mozzarella but have never tried burrata, I suggest you try to find some! Burrata is usually made by hand. The outside of this cheese is mozzarella. It actually looks like a soft mozzarella. But, the inside is stracciatella cheese and cream. Burrata has a rich buttery taste, hence the name. 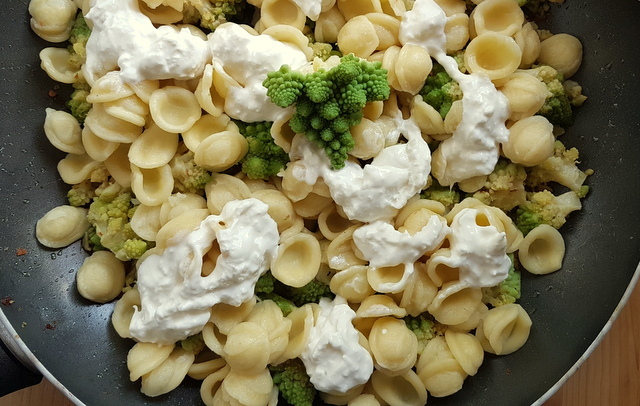 It’s incredibly delicious and adds a wonderful creamy texture to this orecchiette pasta with Romanesco broccoli. 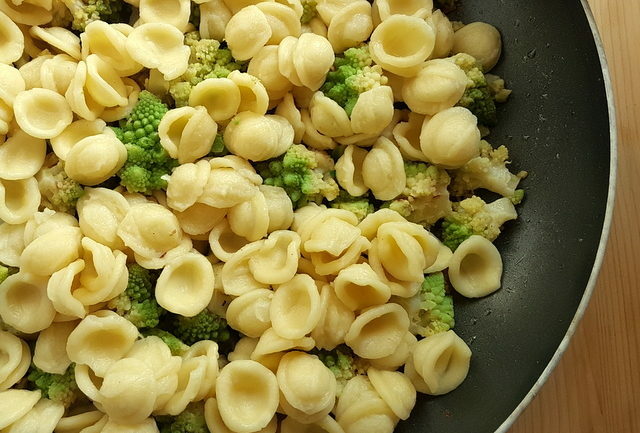 Orecchiette pasta with Romanesco broccoli is full of goodness! 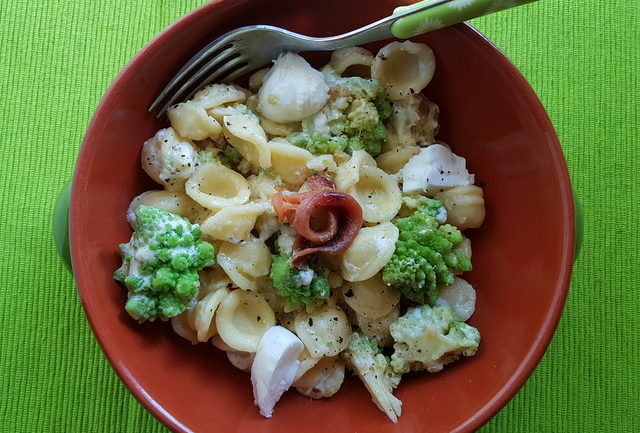 This orecchiette pasta with Romanesco broccoli recipe is easy to make and doesn’t take much time to cook. You can make it vegetarian by leaving out the anchovies. However, even with the anchovies, it doesn’t taste fishy at all. 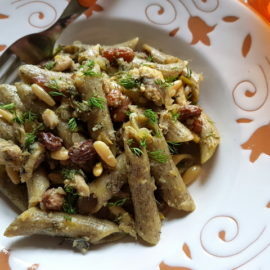 Anchovies are a common ingredient in Southern Italian pasta recipes. They are often melted into sauces and add a wonderful umami, salty seasoning. Anchovies also contain protein and other vitamins and minerals. Just 5 anchovies contain 9 grammes of protein! And, of course, the Romanesco broccoli is full of goodness too, It’s rich in vitamins C and K, antioxidants and dietary fibre! So, not only delicious but nutritious too! 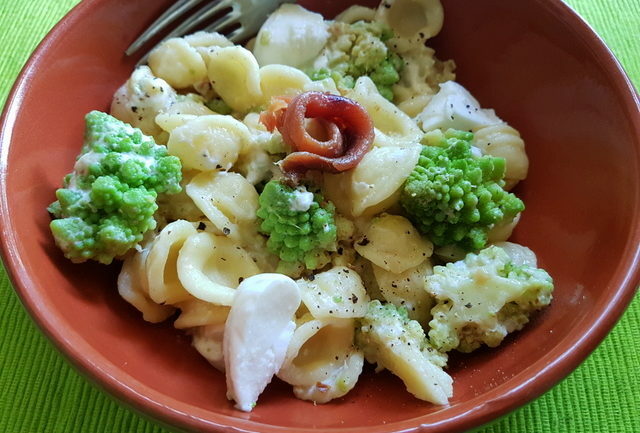 If you make this orecchiette pasta with Romanesco broccoli recipe, I’d love to hear how it turns out and if you liked it. So, please leave a comment here on the blog or on The Pasta Project Facebook page. Do you love orecchiette pasta? Me too! Check out these other orecchiette recipes. Orecchiette with zucchini and speck. This tasty and nutritious pasta with Romanesco broccoli is based on a traditional dish from Puglia, Southern Italy. It's easy to make and, of course, you can use other types of broccoli. Wash the broccoli and cut off the stalk and break it into florets. Peel and chop the garlic. If using fresh peperoncino, cut it open, remove the seeds and cut into small pieces (use as much as you require depending on how spicy you like your food. I would recommend 1 tsp). Cut the anchovies into small pieces. Cook the Romanesco broccoli florets in plenty of salted water for about 10 minutes (they need to be quite firm), then drain them, rinse under cold water to preserve the colour and put them aside. While the broccoli is cooking, heat the extra virgin olive oil in a frying pan or iron skillet with the chopped garlic and the anchovies. Add a little dried or fresh chili pepper according to your taste. 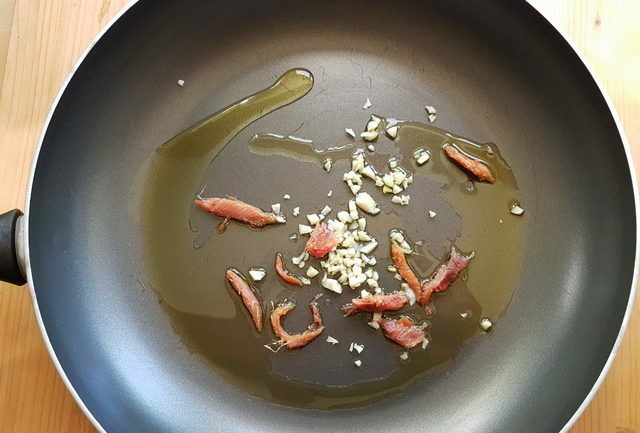 Cook until the garlic has softened and the anchovies have melted. When the anchovies have melted add the drained Romanesco broccoli florets and cook over a low heat until the florets start to break apart. Add salt and pepper to taste. Put a pot of water on to boil for the pasta. Add salt once it starts to boil. Bring to the boil again and add the pasta. Cook the pasta al dente according to the instructions on the packet. When the pasta is ready, save a cup of the cooking water and drain. Add the pasta to the broccoli with a little of the saved cooking water. Mix everything together. Cook for a minute over a high heat. If it seems dry add a little more pasta cooking water. Cut the burrata into pieces and add it to the pasta and broccoli, mix and serve immediately. The combination of the warm pasta and the cold burrata is delicious. You can also add a dash of olive oil. Even more delicious! If you can't find burrata you can use mozzarella instead. Normal broccoli works very well in this recipe too. In fact, in Puglia, that's what they use. So many pasta dishes, so little time! This orecchiette dish looks fabulous! One I know my family will enjoy. Haha! It’s true Ellen, there are so many wonderful types of pasta and ways to cook it and not enough time to try them all!I’m trying though!! This dish is really delicious! I’m sure your family will think so! This sounds amazing! I love broccoli and I love pasta so this is the perfect combination of flavors! Thank you so much Stephanie! Yes this is a great combination. I love Romanesco broccoli! I love all of the historical notes you give in your posts and this pasta looks so good! Thank you dear Mireille! I love researching food history and sharing it so I’m happy to hear you like it! First of all I LOVE Orecchiette pasta. 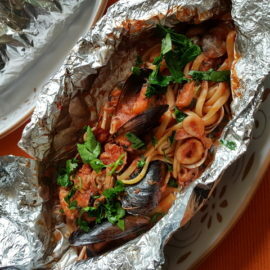 As you may be able to tell by now will all the comments I Have shared on your blog, I love hearty pastas. Romanesco is very beautiful. Have not cooked much with it but it is a delight to use in food stlying. Burrata is my bae and anchovies make everything better. Love the sound of this simple umami-loaded dish. Wish I could find burrata in Aruba. Miss living on the other side of the pond for LOTS of food laden reasons. Thank you Kari, I’m with you when it comes to orecchiette. Such a great pasta. Wow you live in Aruba! I’d love to visit one day! The dish looks very tasty. I love the simplicity of this dish. Pasta is always an ultimate comfort food. Very interested in trying this dish. Oh my! This sounds so amazing and totally one bowl of goodness. Anchovy does a special touch to this dish and broccoli rabe….it’s been a while since I had it. Yum! Oh my goodness goodness, YUM! Orecchiette is one of my favorite pastas to make… their shallow depression hold just enough sauce to be perfect. I’m hoping my Romanesco broccoli grows well this year so I can try this! Romanesco broccoli is so much fun to use is so many ways. Like the fact you are using it with orecchiette that is one of my favorite short kinds of pasta. Need to make it this weekend! 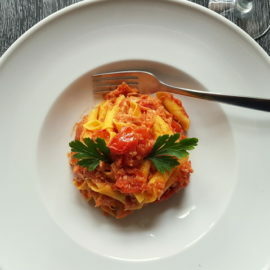 Every recipe of yours I just want to pack up and head to Italy, my kids love pasta so I will give this a go this weekend! Ohhh, orecchiette is one of my favorite pasta shapes, and I’m obviously obsessed with burrata. I was just thinking a good pasta dish this weekend sounds delicious, so I’ll have to give this a try! I have not met a pasta dish (except squid ink) that I did not love. This sounds delicious. Love the shape of the noodles, and romanesco is such a cool ingredient to work with, not to mention delicious too. Sounds like a great pasta dinner to me. I didn’t know broccoli came from Italy, and not popular in the US before the 1920s, that is so interesting! This dish looks amazing, I am going to find burrata now! I have never seen or heard of romanesco broccoli but its so cool looking. I would love to try the broccoli and this orecchiette pasta dish! Romanesco broccoli really is amazing not only because it looks fabulous but it tastes really good too! I hope you’ll get to try it Kelly! Romanesco broccoli is really good Rebecca! I’m sure you’ll agree once you try it! Thanks for stopping by! Pasta dinners are such a great go-to family favorite! This one looks fantastic! Thank you Demeter! Yes pasta is a family favourite all over the world! And there are so many wonderful types of pasta and yummy ways to cook it too! I am i love with anchovies so I’m sold on this dish. Plus I love that you added burrata! Thanks so much Danielle! I love love burrata and anchovies too! 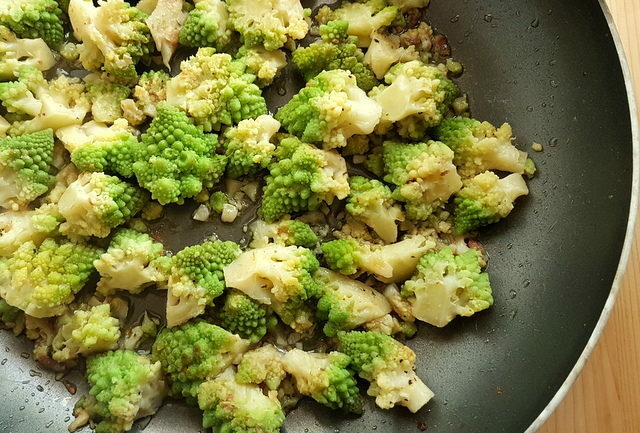 Using them together with the amazing Romanesco broccoli makes this recipe a really winner! 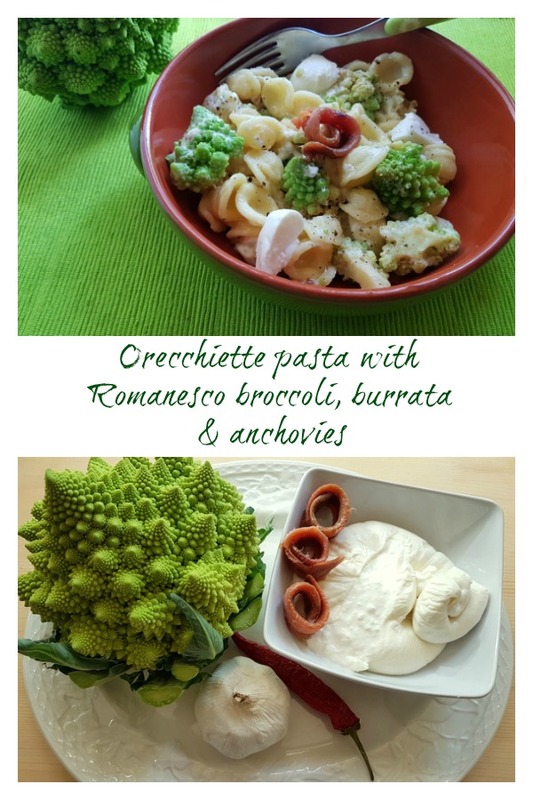 Love easy pasta recipes for dinner and this orecchiette pasta with romanesco broccoli is surely a winner. Grazie Sandhya! Yes, this is actually a pretty easy dish to make and so delicious too! Such a pretty dish and so much flavor! Will be making this for my family soon! Thanks Kim! I’m sure your family will love this dish as much as we do!